Hi ya'll! I'm Jada and I am here today representing Lubbock, TX. I was born and raised in Texas, and have lived here most of my life. I spent about 11 years in Houston, and then moved North of Dallas, where I have lived for 13 years. I have a husband and 2 year old son that keep me busy, and I find time to squeeze in quilting when I can! I have many friends who live in Lubbock that assisted me in the "information gathering" portion of this blog post and I cannot thank them enough! Most of you guys will have a specific reason for visiting Lubbock, because as you know, there's not a whole lot out there in West Texas, but I promise, Lubbock is a lot more fun than you might expect! First, you can always tour Texas Tech. The campus is beautiful and even if you have no reason to go there for college, you can learn a lot of great history about the city and fun things to do while on these tours. You could try visiting the Buddy Holly Museum or go to the Stars and Stripes Drive-In Theatre. Both of which are super cool :). There is also the First Friday Art Trail, McPhearson Cellars, and the Texas Tech football games. If you're hungry, there are a ton of great places to eat! One of the places I am most excited to try on my next visit is called Cagle Steakhouse. These guys are family owned and they serve beef from their own ranch! How cool is that?? Thanks Erica for the recommendation! Another one that is high on my list of "To Try Restaurants" is One Guy From Italy. Apparently their pizza is incredible, and they have 2 locations to choose from in Lubbock. You could also try West Crust Artisan Pizza if One Guy is too busy, or you could check out some of the other restaurants that many Lubbock locals frequent such as: Triple J's, Caprock Cafe, Harrigans, or Blue Sky Texas. Although Lubbock may get a reputation for being a sleepy West Texas town, there is plenty of nightlife to keep you entertained. Whether you want a club with music for dancing, or a laid back bar that's open late, Lubbock has it. Just to name a few, you should check out Cricketts Bar, Chimys, Mesquites, the Roof, and Cafe J. Don't forget to check out J&B Coffee to stock up on caffeine before checking out the quilt shops! Speaking of Quilt Shops, one of my favorite fabric designers, Vanessa Goertzen, told me about a great little shop called Cottage Fabrics! In addition to carrying a lot of great fabrics, they are also one of the local Janome dealers for that area. Be sure to check them out! If you enjoy a little paper crafting with your quilting, Snippits! is a great place to check out as well. They cater to scrapbookers and quilters, so it's a great place to find some kindred spirits, or if you're like me, where you can find someone to scrapbook all those great pictures while you're busy making quilts! Now, onto what you've all been waiting for, the Texas Road Trip Lubbock Quilt Block!! I decided to incorporate a little "Southwestern Flare" into this block, while still keeping it modern and fun with the fabric choices. This block is made entirely of HSTs, which happen to be some of my favorite blocks. They are so versatile and by just turning them or rearranging a tiny bit, you can have an entirely new quilt block. I chose to make mine 4 at a time, so I will be showing you guys a new way to make HSTs, that I actually prefer. And bonus! No marking required!! I know, I was hooked after trying it once. Repeat this process with your other 2 teal fabrics, and your 1 pink fabric. Next, line up your ruler diagonally across one of your stitched together blocks and cut, but DO NOT PULL THE PIECES APART FROM EACH OTHER. Turn your ruler and cut from the opposite corner diagonally across the block again, and now you should have 4 HSTs. Repeat this process for the rest of your blocks. Now you will press your HSTs before you trim them down to be sewn together. I personally would press the seams open since this is such a small block, as this will help reduce bulk at the seams. Once you have pressed your seams, it is time to trim your HSTs to 2 inches. Just for reference, you should have 12 white/teal HSTs and 4 white/pink HSTs. After all of your pieces are trimmed to 2" it is time to assemble your block! Begin by sewing your rows and refer to the picture above to ensure you have the correct placement. Now that you have all of your rows sewn, go ahead and press your seams open before sewing your rows together. After pressing your seams, you can begin to sew the rows. I usually am not a "pinner", but for blocks this small, I make an exception. And bonus points if your pins match your fabrics!! and get ready to reveal your adorable Lubbock block! And there you have it! I hope you have enjoyed making this block as much as I did and that your next trip to Lubbock exciting and fun. Thanks for joining me on this journey and I cannot wait to see what you guys create. GIVEAWAY CLOSED - congrats to @chelengeorge over on Instagram! I have a lot of favorites but since the new one just came out my current favorite series is from Diana Gabaldon outlander series. This is such a cute block Melissa! 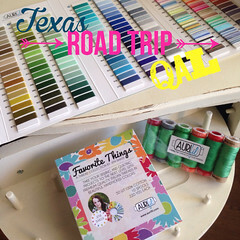 I've been keeping my eye on the TX QAL! We lived in Texas for 7 years (Austin and Houston areas) and loved it. We moved to TN almost 8 years ago, but would still love to move back! my fav book is a short one with a long name "journal, the short life and mysterious death of amy zoe mason. found by kristine atkinson and joyce atkinson". I am making my quilt half size... these are going to be some tiny HSTs! I have too many favorite books to choose just one, I'll just say that my current favorite author is Michael Connelly. Love your block! My absolute favorite book is Outlander by Diana Gabaldon. I've read it so many times I've lost count! The block does have a southwestern flair. I live in Brownwood and there isn't much here either. I'm also not a reader (I know you're gasping)! But I love a good quilt magazine! Great method for making HST. I like reading Jennifer Chiaverini's Elm Creek series of books. I am now following on IG. Thanks for the giveaway! HI, such a neat quilt block! Love the block you chose! My favorite books are cheesy chick books. I like Meg Cabot, Sophie Kinsella, and Janet Evanovich. I'm not on Instagram but my favourite book is half the sky. It's an inspiring book and one every woman should read and share with their friends. Cute block!! Terrific giveaway, too! One of my favorite fiction books is The Eustace Diamonds, by Thomas Hardy. My current favorite motivation book is The War of Art, by Steven Pressfield. My favorite book (today) is the first book in the Game of Thrones series. My favorite book at the moment is Lost in a Good Book by Jasper Fforde. Jada I am currently reading The Bully Pulpit by Doris Kearns Goodwin. But my faves authors are John Updike, Amy Tan, Wally Lamb, John Irving, David Sedaris and Barbara Kingsolver ... In fact Poisonwood Bible might top my list. But I also like a lot of non fiction and art history. Have I totally bored you yet? Love the block.thanks for achance to win. Sincerely, Paula K.